aziza z had the most liked content! 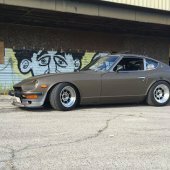 Hello, Im looking for a COMPLETE and unmolested 75-78 280z wiring harness. Must be complete with all connections and relays. I need the body harness and dash harness. I prefer a 75 however any year will do. Let me know what you have. Recent swap. Lt1 T56. Car wont go into gear! help! Looks like Im going to drop the transmission again then. Clutch was never removed during the swap process. I bleed the clutch by pushing the rod in the slave cylinder, then bleeding the master up top. I even tried the conventional pump method. No more air is coming out. What is the preffered way to check for air? Pretty sure there is no air but I could be wrong. Mine is the push type. I just went and got a slave from autozone that was specific to the 93 lt1 camaro donor car. The fork seems to just "bottom out" though. Isnt it suppose to have a "spring" feel to it? Could be something with the throwout bearing then? Hello, I recently completed an lt1 swap into my 240z. I had the complete donor 93 camaro before the swap. So I know it shifted fine before. However after the swap I cannot get the car to go into gear. What am I doing wrong? Autozone slave cylinder, custom stainless steel line, Wilwood 7/8 master cylinder. Everything is new. I Thought I had a faulty master and swapped for another one. No difference. There is no air in the system. I have been bleeding it for days. Basically the car goes into all the gears when the car is off no problem. However, when the car is on it wont go into gear. I even tried to adjust the pedal travel. I adjusted it for maximum throw but it makes a pretty bad noise when the clutch is pushed all the way down. I have since backed it out a little and it doesn't make the noise. I think something might be going on with the clutch fork. When I take out the slave cylinder and push on the fork it doesnt seem to move. But Im able to move the fork around rather sloppily side to side. Is it suppose to be like that? Any ideas on what I did wrong? Any help is appreciated. Thanks! Cant wait to see the new results. Good luck! Im def considering these for the widebody. They fit so well. Any ideas? Shouldn't increasing the bore size make the life of the master cyl longer? I mean, its not being used as hard? Thats a complete guess. Just thinking out loud. Any help is appreciated. I would like to eventually cam the motor, get a lightweight flywheel and better clutch so Id like whatever upgrade I do to last those modifications. Listed more stuff like windows and all. Never did update this thread. Heres is what i ended up with. After 3 track days, im happy with it (for now). Added brake ducts and front splitter as well. with brake ducts- before the brake ducts - grill still hides everything when its not on track duty- mock up - brake ducts (while it was under construction) front spitter (still needs to be finished a bit better, i dont like the current fitment)- Ill get better pictures for you guys. As far as suspension? : Skyline r300 diff (3:70), 300zx cv shafts, 240sx rear caliper conversion, adjustable camber plates all the way around, modern motorsport coilovers, mr2 front shocks, 240z front shocks in the back, arp wheel studs and titanium lug nuts, wilwood front brakes, stainless steel brake lines, techno toy tuning front tension rods, zforce rear adjustable control arms, sportmax 17x8 front(235/45/17) and 17x9 back (255/40/14). Car has an LS1/t56 List goes on and on and on. haha not really. It does make clean up a little easier though. Ill just have to bite the bullit and get a custom bra made for it.